When you are out with your baby, it is important to leave home prepared. From diapers to extra clothes and other must-haves, you should always have these packed in the diaper bag whenever you travel with your little one. In addition, the diaper changing pad is an essential item to bring along with you. After all, you never can tell when there is a need to change your little one’s diaper while on the road. So, be sure to have a changing pad that you can carry along and stash in your bag for your child’s needs. Here is the best diaper changing pads to choose from, and find out more about their features as you read this review. Made of waterproof materials, this changing pad is easy to clean and wash. Just rinse off with water and dry using any clean cloth, and this pad is ready to be used the next time your baby’s diaper needs to be changed. 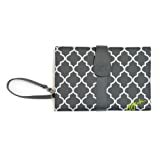 The pad also comes with a cover, and you can purchase this item separately. 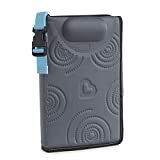 There are various colours and design available for the cover, so you can customize it according to your preference. Most importantly, the liner is waterproof, so it keeps this area dry and comfortable for your little one. 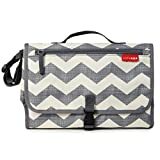 This portable changing station features a front zipper pocket where you can place your smaller personal items such as your keys, phone, and wallet, among a few others. 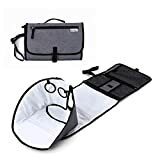 There is a strap with small clip that hangs conveniently on your wrist or stroller, and the mesh pocket is spacious enough to hold as much as 4 large-sized diapers, lotion, cream, or other essential baby items. You can also use the translucent wipe case, and this lets you know easily when this needs to be reloaded. When you travel with your baby, having a portable changing station such as this product is essential. In particular, this item is padded completely to ensure your baby’s comfort when there is a need for a quick change whenever and wherever. Since it is padded, it keeps your baby well-protected from dirty surfaces and it is large enough to provide total body protection to your baby. 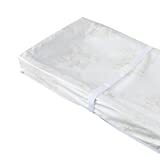 With a Velcro closure, you can seal this changing pad and keep it free from dust and dirt when not in use. Hence, you can make sure that your baby is free from skin irritation and allergies since this changing pad is clean and dirt-free at all times. This is another must-have changing pad that every parent should bring along to their trips with their baby. Aside from a changing station, it comes with 25 large bags, which you can use to place soiled diapers for discreet and easy disposal. The pad is cushioned for your child’s comfort, and there is even a head pillow that keeps your baby relaxed while you change his or her diaper. The changing pad also has spacious mesh pockets, and these are perfect for placing other essentials when changing diapers such as the wipe case, cotton balls, and clean diapers. Lastly, it comes with an expandable section to accommodate your growing baby. Made of 100 percent polyester, this changing pad is sturdy, durable, lightweight and easy to clean. It also comes with imported materials that can last for a long time, so you can be sure to get the best value for your investment. When unfolded, this pad can extend up to 19 x 28 inches, which is a spacious area for your baby. There are also special pockets included where you can place several diapers and wipes, as well as other essential items when changing diapers. This changing pad has a contoured shape that ensures your child’s comfort and convenience in each diapering session. The surface of the pad is made of organic cotton, so this keeps your baby comfortable while providing ample support for your little one. There is also a 3-sided closure and a buckle that has an easy-release feature, which offers security for your baby. 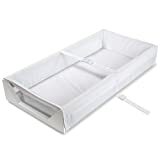 In fact, you can even use this item on a standard changing table or in dressers. Most importantly, the cover is made of durable and waterproof vinyl material, so this prevents stains and moisture. An essential item for busy parents, this changing pad is a must-have for you to bring whenever you travel. It is made of waterproof materials with a quilted surface that is soft and comfortable enough for your baby. When rolled up, this pad becomes small and portable to bring along for your travels. As for the size of this pad, it has a dimension of 17 x 25 inches, so it can be used for babies and toddlers. It also rolls up to a smaller size of about 8 x 3 inches to make it easy to bring all the time. 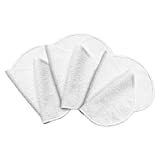 Most importantly, the quilted surface is waterproof and soft, which makes this pad comfortable for your little one during diaper changing sessions. Made of washable and waterproof cotton fabric, this changing mat is an essential item that you should always bring in your bag. It is portable and compact, which makes it easy for you to bring during your travels. You will like the fact that it is lightweight and convenient to just grab along when you need to get on the road and travel with your baby. What’s more, this changing mat is made of safe materials, which means it does not contain BPA, PVC, late and palates that are harmful to your baby’s health. Never leave home without a changing pad when you are travelling with your baby. This product, in particular, is a must-have for every parent since it makes every session of changing your baby’s diaper easier and faster. This pad has Anti-slip rubber at the bottom to keep the pad in place, and there is a foam insert that is flame-retardant. The sides are also contoured, so it can accommodate your baby and toddler for optimum comfort during diapering. Choose from these changing pads and experience the comfort of keeping your baby’s diaper clean and dry when you are on your travels.